Rory McIlroy's season may still turn out to be a huge success but the speculation that he's about to announce a huge new deal to play TaylorMade clubs is interesting in the light of Paul McGinley's comments at the Masters that he needs "closure" on his equipment sooner rather than later. McIlroy complained at the Masters that there was nothing he wished he had changed at the Masters but his golf ball, prompting McGinley to wonder if it wasn't high time the world No 2 settled on his clubs. Now, a month before the US Open, McIlroy appears to be preparing to make another big change with Golfweek and other outlets speculating that the teaser Instragram video McIlroy posted of him hitting what looked like TaylorMade's M2 driver is a sign that he's putting new clubs in the bag for The Players this week and signing with TaylorMade as a big money brand ambassador. Following Nike's departure from the club-making business last year, McIlroy said, "I'm not going to commit to anything. I wouldn't be surprised to see me not go with a manufacturer for a year or two, just sort of play with what I want to play, play with what I'm comfortable with, and go from there." He experimented with TaylorMade clubs in the off season and tried the Callaway Epic fairway woods for the Masters as he felt they were best suited to his ball flight in combination with the "spinnier" Titleist ball. He also used Callaway irons at Augusta but when asked if there was anything in his game he'd like to change after finishing six shots outside the playoff between Justin Rose and Sergio Garcia, he said: "I felt my golf ball this week was doing things in the wind that was very inconsistent. There's one thing I'm going to change. I'm going to try to work on over the next few weeks." Both Golfweek and Geoff Shackelford report this week that McIlroy is about to announce that he's signed as a TaylorMade brand ambassador but will continue to wear Nike apparel under the reported 10-year contract he signed with Nike earlier this year. McGinley believes McIlroy was "smart" not to sign an equipment deal straight away when Nike pulled out of the market. But the former Ryder Cup captain wondered after the final round at Augusta if it wasn't high time he settled on his definitive bag set up. After seeing McIlroy finish in the bottom quarter of the field from tee to green at Augusta National, McGinley said: “He’s obviously changed his equipment and we know he had trouble when he changed to Nike first of all. "What he's doing by keeping is options option is a smart move, not tying himself to a contract with any one manufacturer and finding out what's best for him. "But that's going to take time and he hasn't got there yet. Yes, we are only in April and that's just four months trying these new products. But he needs to get closure on that pretty soon. "You can practice as much as you want in beautiful weather conditions on Trackman and all of that. "But you don't know until you get into tournament conditions when the adrenaline is pumping, when the wind is swirling. "You have got to trust your equipment so that's a big X Factor that he has to take care of." The bigger question for McGinley is why McIlroy opened with rounds of 72 and 73 to leave himself five shots behind at halfway. He said: "Only Rory and his team know the answer to that. These are the questions he needs to ask himself. "Why did I not playing very well the first two rounds? Where am I at with my equipment? And when am I going to get closure? I need to do that." 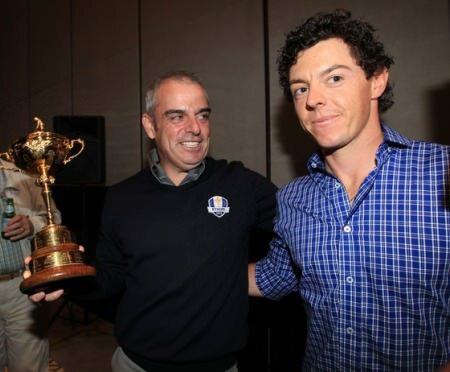 McGinley breaks silence on McIlroy - "Rory is not arrogant"
Rory McIlroy congratulates Paul McGinley in Abu Dhabi in January after he was announced as European Ryder Cup Captain for 2014. Picture: Fran Caffrey/www.golffile.iePaul McGinley is not a man given to publicly criticising his potential players for next year’s Ryder Cup, especially the man who almost single-handedly turned the captaincy campaign in his favour with his consistent shows of support in public and on Twitter. Can McIlroy bounce back from his disappointing display at the Masters?